It’s a startling statistic: More than 400 Americans die each year from unintentional carbon monoxide poisoning. And there’s often a spike in such deaths as the weather turns colder. It’s often referred to as the silent killer, and for good reason. Carbon monoxide (CO) is a colorless, odorless gas that comes from burning fuel (think cars, gas fireplaces, furnaces, stoves, ovens and even wood and charcoal). When it’s inhaled, it’s absorbed into the bloodstream. Because CO molecules stick to hemoglobin in red blood cells better than oxygen, it replaces oxygen within those cells. When less oxygen is delivered to the body, organ damage or even death can occur. While your senses may clue you in to the presence of most poisons, carbon monoxide is undetectable by humans. Even more dangerous, symptoms of poisoning are fairly vague and resemble symptoms of influenza, which is also common in the winter. It’s human nature to want to stay warm when the weather turns cold, but how you go about doing that is critical when it comes to preventing carbon monoxide poisoning. Avoid running vehicles inside garages, especially those attached to your home. Even if the garage door is open, wind can force exhaust fumes back into the garage or prevent them from escaping altogether. Never run generators, use portable stoves or burn charcoal inside the home. Don’t use gas stoves or ovens to heat the home. Have your gas- or other fuel-burning appliances serviced at least once a year to ensure they’re working properly. 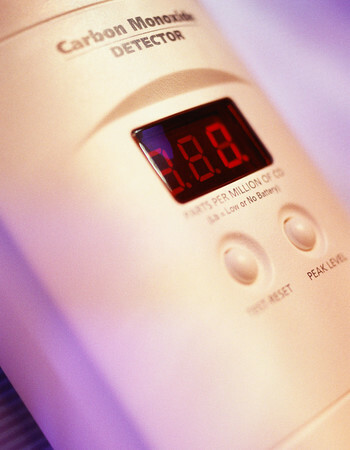 Keep in mind: While prevention is important, a good carbon monoxide detector can be lifesaving. You should change the batteries in your detectors at least twice a year. This is easy to remember if you stick to the daylight saving rule: Change your batteries when you change your clocks. Also, pay attention to the life span of your detectors and replace them appropriately. If a CO detector alarm goes off or you believe you have CO poisoning, get out of the house immediately and call 911. Don’t try to treat CO poisoning yourself, and never drive yourself to the hospital. Dr. Brian Harris is an internal medicine physician at Methodist Physicians Clinic Regency. Meeting people and building relationships are what he loves most about the job, and his favorite moments come when patients express their gratitude. “That just tells me I'm making an impact and doing something good,” he said.